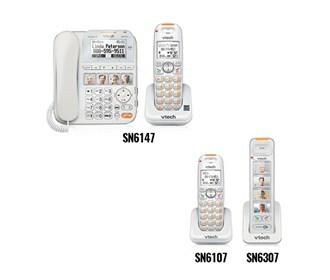 The VTech SN6147 + SN6307 + SN6107 is a corded/cordless CareLine™ home safety telephone system that is equipped with the latest DECT 6.0 digital technology, which delivers increased clarity and enhanced security. The Voice Announce caller ID function announce the names of your callers through the speakerphones. One can store 50 names and numbers and 50 caller logs. This phone has oversized buttons and easy-to-read display screens that make the system super easy and comfortable. The SN6147 + SN6307 + SN6107 handset speakerphone makes hands-free conversations easy. It is expandable up to 12 handsets using only one phone jack. Other features include trilingual menu support, any key answer, call intercept, call screening, and message waiting indicator. It also features Caller ID Announce that always allows you to know who's calling, even when you're in the other room. Program four frequently dialed phone numbers and attach a photo to each one for convenient speed dialing. The VTech SN6147 + SN6307 + SN6107 has many exciting features for users of all types. See the VTech SN6147 + SN6307 + SN6107 gallery images above for more product views. The VTech SN6147 + SN6307 + SN6107 is sold as a Brand New Unopened Item.